Tinysandtea: New Ideas, New Stuff! Finally! I have shot, downloaded and uploaded my latest polymer clay creations! I have molded a few different characters. First, my cute Little Miss and Mr Men characters from the series! I use to read these tiny books over and over again and I have quite a big collection now! I have created a Little Miss Naughty, Mr Clever, My Bump, Mr Messy and Mr Happy charms! 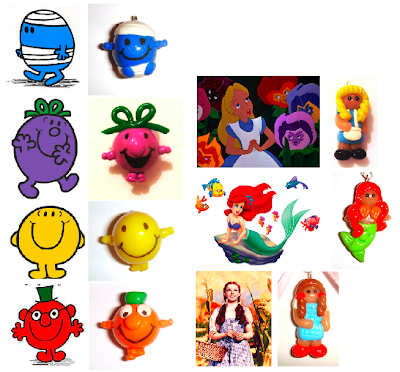 I intend in making a charm bracelet with these characters, necklaces and earrings with the huge range of Little Miss and Mr Men Characters! Second, I have also molded Alice in Wonderland, Ariel and Dorothy charm. I love the disney series and would like to do more of these characters (I think they look so cute!). Third (and last), I molded a Homer Simpson charm! With his favourite food in the whole wide world - Donuts! Pretty similar to the real pictures don't you think? I'm quite proud of them! Hopefully I'll get better as I progress! Please leave comments of what you think! Thank you so much for stopping by at my site. I used to read the Mr. & Mrs. books also and now I have my son, who's 6, all into them. They even have a cartoon of them on cartoon network. Love your creations! Thanks guys! Yeah I am still in love with all the Mr Men and Little Miss books. I have dozens at home and am never going to throw them away!